Momentary interruption of the nature stream to invite everyone to a free performance at the Labyrinth Bookstore, Thursday, March 1, 6-8pm, as part of an Art Walk event downtown. All original music, organically composed using local ingredients. More about the band at sustainablejazz.com. You can still find a few of these dead stems of spicebush standing in Princeton's preserves, pockmarked with holes reminiscent of cholla cactus wood we used to find in the deserts of the southwest. They tell a remarkable story of a forest understory's rebirth. Seven years ago, instead of this cluster of healthy stems you would have seen one old stem too tall for the deer to reach, and a dense cluster of tiny stems eaten nearly to the ground. Soon, those old stems, which singletrunkedly kept the shrubs alive back when deer browsing pressure was high, will have rotted back into the ground amidst the crowd of younger stems that now, with reduced deer numbers, can grow to maturity. The many healthy, multi-stemmed spicebush serve as monuments to those single stems that kept the bushes alive through a period of ecological imbalance. I had heard there was a house somewhere near Princeton where George Washington stayed for awhile. Over Presidents' Day weekend, we finally made it out there to have a look. Conveniently, for us if not for the owners, the house has moved a mile closer to Princeton over the years, displaced several times by an expanding quarry. Now owned by the state, the house has hopefully reached its final destination on a bluff just outside Kingston. They've planted an orchard in the field--something the Princeton Battlefield has in its long-range plan to recreate a more authentic landscape. Washington's several month's stay was eventful, as described in this borrowing from Rockingham's kiosk. Behind the house is a new colonial garden. Someday I'll return to ask if raised beds were common back in the day. Thorns from hawthorn trees were used for pins in clothing. Next to the hawthorn are some old-fashioned rose bushes with nutritious general-sized rosehips. Though it may prove auspicious for pest control, I doubt that this praying mantis eggcase would have been found in a colonial garden. According to some internet searching, there are 20 mantis species native to America, but the 2 most common species were introduced from Europe and China. After the tour (Did you know that the colonists won only three battles during the whole Revolutionary War--Trenton, Princeton and Yorktown--and that Washington's hair was real? ), it was closing time as the shadows grew long and the staff made the hike from the visitors' center to the house. Depending on the status of the towpath these days, this is a very reachable destination by bicycle from Princeton, as the house is perched just above the towpath a mile or so past Kingston, with a path leading up through the woods. Check out the programming at http://www.rockingham.net/. I haven't heard anything official, but it looks like the lower dam at Mountain Lakes Preserve is nearly complete. The wooden posts in the foreground mark where a ramp once was located for hauling chunks of ice out of the pond and hoisting them into the 3-story ice barns that used to rise behind the dam to the right. The ice operation closed down around 1930, as refrigerators became more widely available. 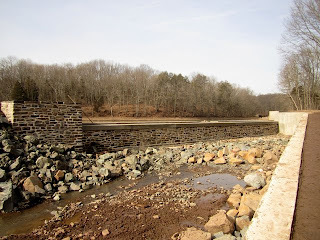 The stone wall extending the length of the dam is completely new, designed to mimic the original wall that now lies buried under the expanded earthen portion of the dam. For safety reasons, the dam is now broader and several feet higher than previously. At the other end of the dam stands the newly restored spillway. As far as I know, the informative signs that were there prior to restoration will be reinstalled, describing the decades during which Mountain Lakes supplied Princeton with ice for its iceboxes. Meanwhile, upstream of the two Mountain Lakes is another dam that was added onto the project, funded by the same anonymous donor. I had long argued in favor of restoring this "upper settling pond", also known as North Pond--an argument that was going nowhere until funding became available. It's located on one of the two tributaries feeding the lakes, and was built in the 1950s by the Clarks, who also built Mountain Lakes House around the same time. The pond is called a catchment basin for good reason. Water rushing downstream from Witherspoon Woods drops its sediment in this pond, thereby greatly reducing the amount of sediment that would otherwise have continued into the Mountain Lakes. It played this role very effectively, completely filling up over the past 50 years. There must be 8 feet of very rich sediment here, which this week is being trucked away, perhaps to a topsoil business. With the catchment basin trapping sediment, at least on that one tributary, the upper Mountain Lake will last much longer before it once again will require dredging. This is my favorite vista, standing at the northwest, upstream end of the lakes, looking down. Strange how learning happens. Here's an unlikely string of events: 28,800 rubber duckies are lost overboard in the northern Pacific in 1992. A high school english teacher named Donovan Hohn eventually hears word of this and leaves his job to find out where the drifting duckies drifted to. He writes a book called Moby-Duck and travels to Princeton to make a presentation at the public library's 2011 Princeton Environmental Film Festival. One of the images he showed is of a baby albatross that died, apparently due to a stomach full of the notorious plastic bits that currents concentrate in that part of the Pacific. But he explains afterward that the photo of the 200+ bits of plastic in the albatross's gut tells only part of the story. Also making life difficult for the albatross is global warming, which he says is making its nesting grounds too warm, and an exotic plant called Golden Crownbeard. Native to the U.S., Golden Crownbeard is, according to my internet research, the most invasive of hundreds of exotic plants on the Midway Islands. Chances are, it hitchhiked to the islands in topsoil--a notorious means by which plants travel to new locales. The plant displaces low-growing native vegetation, making tall dense stands unsuitable for building nests, sometimes growing so fast that the adult birds lose track of their young. Managers of the refuge are hoping to eradicate the plant from the islands. A rubber ducky spill in the north Pacific, then, ended up bringing to Princeton a very familiar story of the impact of plant invasions on native wildlife, and the human efforts going on around the world to restore ecological balance. Sometimes, bringing firewood in can get complicated. Nature has taken what was intended as a simple backyard woodpile and turned it into sleeping quarters and storage barn. This wooly bear caterpillar, having a fine winter's snooze amongst the squirrels' stored acorns, must not have been pleased when I inadvertently liberated its roof to heat our home. Hopefully it liked the alternative accommodations I hastily prepared for it. The next log removed exposed this tent village of spiders. They too were relocated, log and all, so as not to suffer any further disturbance to their slumbers. Woodpiles are the highrise apartments of backyard habitat, packed with nooks and crannies to serve a diverse clientele. Looks like the best compromise is to have more woodpiles than one will use in a given winter, so that at least some of the backyard residents will have their sleeping quarters left undisturbed. Very interesting program tonight from 7:30-9pm, for kids and adults, about wildlife that help farmers. Led by the county naturalist. Great description here. Note: I got reports that this event was magical. A schedule of Howell History Farm programming, some of which is led by Mercer County naturalist, Jenn Rogers, can be found here. 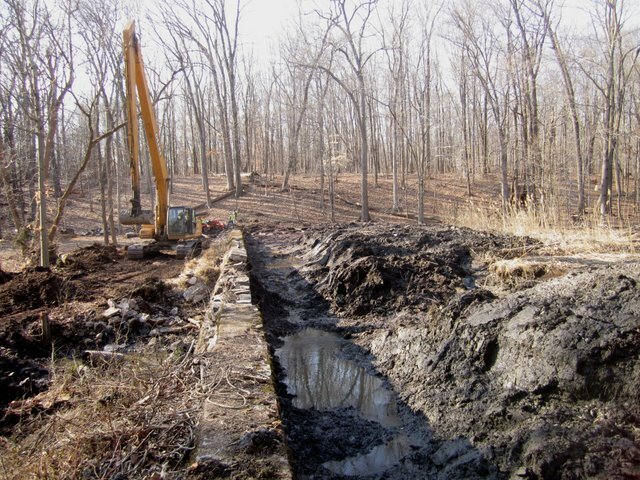 One project I was able to get implemented at Mountain Lakes House in Princeton is the construction of a raingarden. I designed and located it so that it would capture runoff from the lawn, driveway and a portion of the roof. Township staff did the contouring, and planting was done by Polly Burlingham of Sigmund Garden fame, financed by a private donor. It was particularly important to redirect runoff from the driveway down this contoured swale to the raingarden. Before, water flowed towards the foundation, which led to flooding in the basement. Now, the runoff will have a positive effect, helping to keep the raingarden wet. A typical raingarden is designed to collect about 6 inches of water, which then infiltrates into the soil over a day or two, creating an underground reservoir of water that the wildflowers, sedges and shrubs can tap into during droughts. Since it was installed last fall, it's still awaiting its first growing season. Plants have been labeled (cardinal flower, joe-pye-weed, winterberry, buttonbush, etc). You can reach this site by parking at the Community Park North parking lot off of Mountain Ave at 206, and walking down the long driveway through the woods to Mountain Lakes House. In the distance in the photo is the recently restored upper Mountain Lake. There, can't you see it, the massive pile of leaves? One of my cause celebres, in case it wasn't obvious from all the previous leaf-related posts, is to get people to keep their leaves in their yards. Nutrients, reduced runoff, habitat, less dependence on municipal services--what's not to like? Obviously something, since so many people dump their leaves in the street regardless of yard size. This residence, located out towards Terhune Orchards at the intersection with Cold Soil Road, shows how leaves can easily be integrated into a neatly maintained yard. Rather than blow the leaves out to where they'll be a hazard next to the road, the owners have a nice cluster of trees halfway between road and house where they pile the leaves. Despite the adding of leaves to the same pile year after year, the pile won't get very high due to decomposition and raiding of nutrients by the tree roots. And anytime the owners want rich compost for the garden, they need only dig into the interior of this pile to find it waiting. Down in the valley, between Faculty Drive and Carnegie Lake, near Washington Road, the geese graze peacefully in the meadow, like a flock of pygmy long-neck dinosaurs. Just across Faculty Drive, a new landscape has been hewn out of what I vaguely remember being a dense patch of scrub near the road. Not sure what the solar panel's for, but it's a nice modern touch. This is the bottom reach added to the stream restoration since a previous post. The relatively steep slope allows a nice series of "cross-vein" structures (boulders assembled into the shape of a "v" pointed upstream, designed to focus flow inwards towards the center of the channel.) In the background, through the woods, are Jadwin Gym on the right and the new chemistry building back to the left. On either side of the narrow channel are floodplains designed to allow floodwaters to spread out, slow down and thereby dissipate their energy, as would happen in a natural stream. Less energy means less erosion, which means less sediment flowing into Lake Carnegie, which in turn theoretically means the lake needs to be dredged less often. Urban streams tend to get badly eroded over the years by the powerful blasts of flashy runoff coming from hardened surfaces in town. A stream restoration such as this attempts to mend the stream, designing in the right amount of meander, floodplain and well-placed rock formations so that it will resist deformation by the erosive force of all that heavy water coming down the hill. Assisting in this goal to some extent are some absorbent green roofs and rain gardens installed in new buildings upstream. The tree trunks scattered in the floodplain probably play some role in slowing or redirecting floodwater. The sewer (or maybe water) line looks like it will have a bridge mounted on it, so that athletes can cut through the woods to get to the playing fields. Looking back down the slope towards Faculty Drive, with geese and Carnegie Lake in the distance. The matting spread over the floodplain should prevent erosion of the freshly contoured soil until grass seed can sprout through it.